DJ Dal once again offered his amazing services to the marvellous couple Rammah and Sunny. The wedding ceremonies took place in Northern Italy, at one of the third largest lakes, Lake Como (see our blog on the Italy feature). Rammah and Sunny have been to several events where they have seen DJ Dal present various sets, so after seeing his service and how great the performance is with the crowd it was no doubt that the couple would choose anyone else but DJ Dal. In fact, DJ Dal was booked before the flights and venues were finalised! 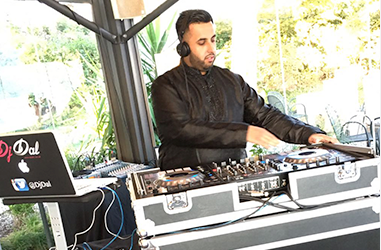 Dj Dal performed at two events, the first being; the Bollywood Sangeet Party on the 21st October 2016 and secondly the Wedding Banquet reception 22nd October 2016. The first occasion, the Bollywood Sangeet Party took place at the Ristorante Acqua Dolce, Via Regina. The guests and DJ Dal were taken to the location via boats from Hotel Regina where everyone was staying. The theme of the wedding was Punjabi, so the men’s wore Sherwani’s and the ladies wore Indian suits. As both families flew from the UK, the music included a mixture of Bollywood, Bhangra and commercial English chart, nevertheless, it was a unique scenery for DJ Dal, rather than DJing at venues every week, this time he had the unbeatable view of the clear blue sea. During the duration of the events, DJ Dal was provided with the equipment by the wedding planner Francesca from the company named WishItalia. After the Hindu wedding ritual in where the Mandap was set outside the lake for the perfect backdrop, the Wedding Banquet Reception was the second event held in the evening located at the grand breathtaking Impero Room, Villa D’Este. To correspond to the venue the theme was Black Tie Event. The reception was based in the basement of the Hotel, located next to a nightclub, so after everyone danced to the tunes of DJ Dal dancing to Bollywood, Bhangra and English hits, there was definitely time for an after party! So there you go! If you are planning a destination wedding then you know who to have! With experience in the music industry and working abroad, there can only be one choice! DJ DAL! So get your enquiries and a booking in fast, 2017 is getting booked!